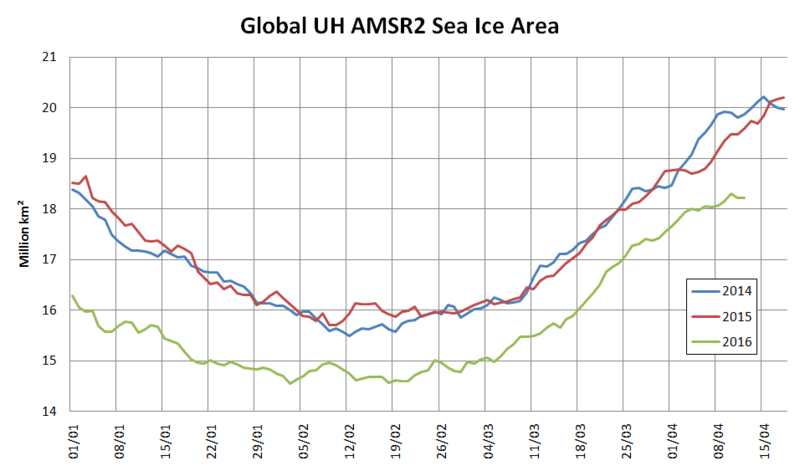 Global sea ice makes a strong comeback as El Nino fades. NSIDC has suspended daily sea ice extent updates until further notice, due to issues with the satellite data used to produce these images. The problem was initially seen in data for April 5 and all data since then are unreliable, so we have chosen to remove all of April from NSIDC’s archive. 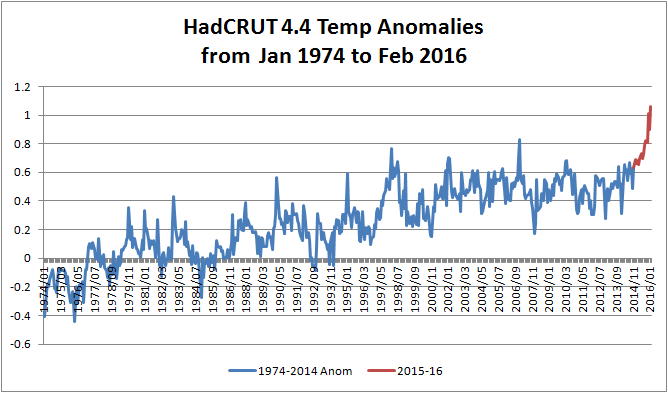 One feels compelled to ask why Willis’s global average temperature graph neglects to mention 2015 when he implies that it does? A few years ago in 2009, I was the first to notice and write about a failure of the instrumentation for one of the satellites used by the National Snow and Ice Data Center (NSIDC) to show Arctic Sea Ice extent. Today, we have what appears to be a similar problem with satellite sea ice measurement. The source of global sea ice information cited in this posting was NOAA’s National Snow and Ice Data Center (NSIDC). They are now reporting issues with the satellite data used to produce these images and this information was not known at the time of the writing of this article. Do you suppose we can now expect a similarly “fulsome apology” from the other players in this tragi-comic farce, together with all their rebloggers, retweeters, plagiarisers and other assorted acolytes? The most worrying element in this virtual holy war about the climate in general are the rebloggers, retweeters, plagiarisers and other assorted acolytes. People do not read the articles, do not check the resources, they act like algorithms in their crude beginning. They pick up a few words in a text they want to find and just repeat, retweet etc. Professor of le faux pas – @Judith Curry. Maybe she likes to be ridiculed in public? I have to admit you need some courage to behave like that. @Kasia – For all I know you may well be correct about Judy Curry. Rest assured we will continue to do our level best to pile on the “public ridicule”! 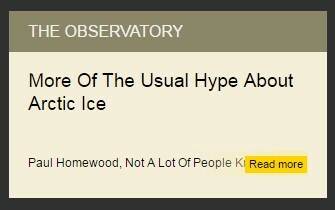 What do you make of this recent example of her selective [Snip]ping activities on her “Climate Etc.” blog? Messrs Curry and Watts hail from the good ‘ol US of A so they are currently asleep if they’ve got any sense. However we figured Benny Peiser from the GWPF and his latest webmaster ought to be awake by now. Heading over to the Global Warming Policy Forum home page anticipating an apology at least the equal of Paul Dorian’s we were instead invited to read yet “More Of The Usual Hype About Arctic Ice“! Needless to say there is currently no sign of my message on the Watts Up With That web site. I have followed the Arctic ice since 2007 and have downloaded most of the NSIDC SIE maps since the beginning of June 2012. So I think I can make an educated guess about what the new map should look like. Suddenly half the Baltic Sea froze and then unfroze in a couple of days and mysterious fields of broken up ice floes appeared in the Barentsz Sea and south east os Salakhin Island. 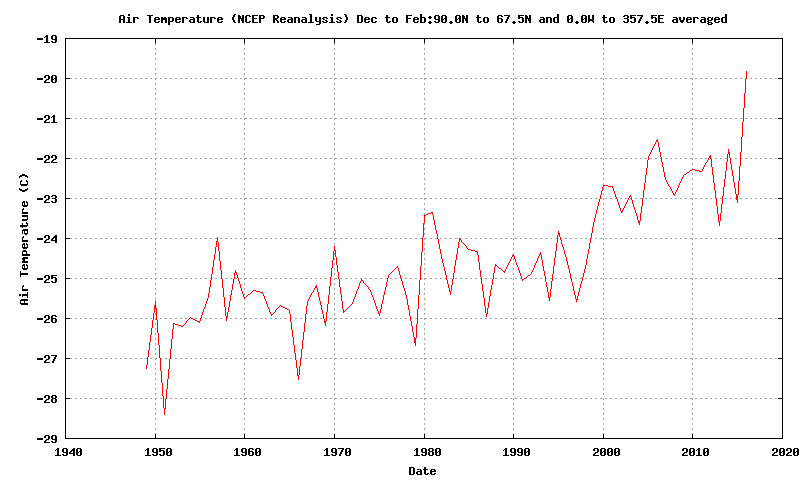 Meanwhile both global and Arctic temperatures were at record highs. Now it is nearly fifty years since I started my ‘A’ level physics course, but I do seem to remember that as the temperature rises ice melts. I also remember, as a chemistry undergraduate, studying the infra red spectrum of CO2. (In those days, it used to absorb in the IR, though many on websites now aver, often in capitals, that it is NOT a greenhouse gas.) In my engineering career I have even come across sensors that developed faults! 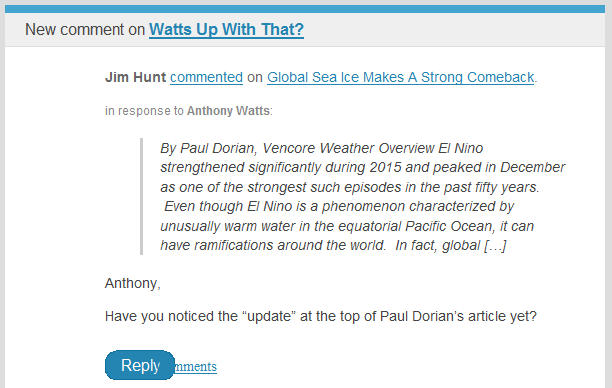 However, who am I to argue with such an august body as the GWPF or an author erudite enough to write for wattsupwiththat.com? Where I am in Colorado, it is snowing, which just totally proves GW is a hoax. Were I still living in Portsmouth, I’m sure I would be gawping at all those icebergs that are now clogging the English Channel. It’s a pleasure to meet another engineer Syd! As luck would have it I live quite near the English Channel. It may be snowing in Colorado, but I’m afraid I have some bad news for you. I see no icebergs! If you’ve studied the infra red spectrum of CO2 perhaps you wouldn’t mind explaining it to a certain Radical Rodent of this parish? He doesn’t seem to care much for my explanation. Fidem rerum semper vincit? Regarding Judith Curry and the GWPF, I fear I am far less charitable than you.